The Double Featurette: Linkage: "Rip! 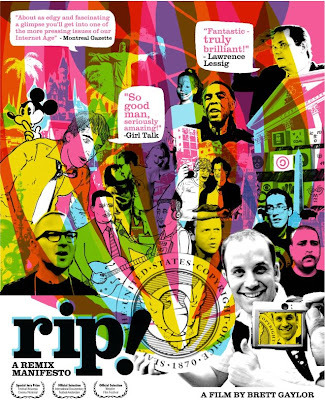 A Remix Manifesto"
Thanks to Ken for sending me this article/ interview with Rip! a Remix Manifesto director Brett Gaynor, founder of Opensourcecinema.org. Gaynor, in addition to a standard theatrical release, has released his film online in a Radiohead style pay what you want scheme. So if you are having a slow day at work and want to mess around, remix some open source footage, head on over to his site. Lawrence Lessig fans: get excited. Wired.com: What are your thoughts on the future of open video? Gaylor: I’m generally optimistic about it. There are a lot of challenges, for sure: Lack of universal standards, third-party rights, bandwidth, access for the developing world, and a lack of basic media literacy among users. On the flip side, I think the internet will very quickly overtake TV as the content-delivery medium of choice, and with that comes the opportunity for a genuine participatory experience. I think the time is now for developing the tools, standards and practices to make sure we don’t just see TV 2.0. In the world of film and new media, there is the sense that history is being made. Kudos for reaching out to touch it.